A sealed heating system does not utilise a header tank in the loft. It is a completely closed system. 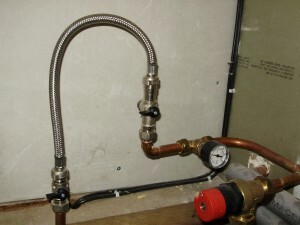 A sealed heating system has a “filling loop” connected to the mains water supply via a flexible pipe. This is used to fill the system to a set pressure, usually 1 to 1.5 bar pressure when the system is cold. There is also a pressure gauge on the system to show the operating pressure. There is also a pressure relief valve on the system with a discharge pipe terminating outside to relieve any excessive pressure which may form in the system. Another major component of a sealed system is the expansion vessel used to accommodate the increase in volume and pressure of the water during the heating cycle. As the system heats up from cold the water expands into the expansion vessel and the pressure increases as the system cools down the process is reversed. In a “system boiler” these components are generally installed within the boiler. Generally speaking all “combi boilers” (combination boilers ie; instantaneous hot water) are system boilers. It is possible to convert a vented system to a sealed system by removing the header tank and adding the required components providing the boiler has a manually resettible high limit stat fitted.